You can have your property’s rooms cleaned of the dust, plaster and grime after refurbishments and repairs, decorating and building work using our services. We offer affordable and comprehensive sanitising of houses, flats, offices and lofts which have been decorated, renovated and changed in some way. Our workmen are supplied with effective detergents and tools for sanitising tiles, bathroom surfaces, kitchen areas, bedrooms and living areas. 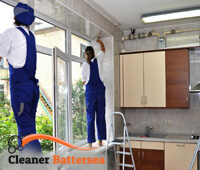 You will have perfectly clean rooms and external areas if you use the after builders cleaning of our company, operating in Battersea and nearby. You can make your home, work place and the property you rent out liveable, rid of the debris and splatters faster by hiring our cleaners to sanitise it. They are supplied with powerful steam, vacuum cleaning, pressure washing and other heavy-duty machines which facilitate their work significantly. The floors, furniture, appliances, tiles, walls and ceilings will be cleaned, dusted and rid of the splatters, markings and grime which have piled on them. Call us to specify your demands and receive professional and effective after builders cleaning for your residential or commercial property, based in SW11 and we won’t disappoint you. You can have your property’s living areas, bedrooms, kitchen, hallway, bathroom and other rooms dusted, hoovering, washed and rid of the debris which the workmen and builders have left. 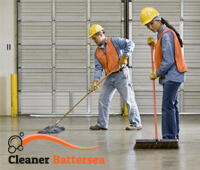 Just call us and we will schedule your after builders cleaning available in Battersea, SW11 for a date and time which is most convenient to you and our staff. The work we conduct is implemented with high-quality detergents, tools and preparations that are supplied by our company and included in the price.